Everything you need to know about the Stony Brook Seawolves as they begin the NCAA tournament. The Case For: The ultimate Cinderella, Stony Brook earned its first-ever NCAA tournament bid by winning the America East tournament. Few teams, if any, could walk into the field of 68 with as thick a coating of fairy dust on their uniforms. And few teams walk into the field of 68 with a player like Jameel Warney, a 6'8" forward who may be one of the most complete, irrepressible performers in the country. Warney averaged 19 points and 10.7 rebounds during the regular season, shooting 62.6% from the floor. His player efficiency rating (35.8) ranks second in the country. His offensive rating (129.3) and his defensive rating (87.1) both rank in the top 15 nationally. Warney’s career-high 43 points in the America East title game were the ultimate punctuation to the program’s drive into the NCAA bracket. And the Seawolves have three other double-digit scorers—senior guard Carson Puriefoy (14.8 ppg), senior forward Rayshaun McGrew​ (10.9 ppg) and junior guard Ahmad Walker (10.6 ppg)—so it’s not entirely The Jameel Show. And while the Seawolves make life difficult for opponents simply by putting Warney on the floor, they have other ways to achieve that, too. They allow just 63.1 points per game, 12th in the country, and allow just 40.1% shooting from the floor, ranking 34th in the nation. If they muddle things up for teams with superior raw talent, and Warney is as efficient as usual, then Stony Brook might have a chance to prevent its first NCAA tournament appearance from being a short one. The Case Against: Stony Brook is the America East champion making its first NCAA tournament appearance. This is no small-conference upstart with a long history of appearances in the event, which might help limit any wonder and awe felt upon arrival at a tournament venue. There’s no history here, at all. The Seawolves should enjoy the heck out of the experience, but it could be a challenge to focus on the task at hand when the task is so new. 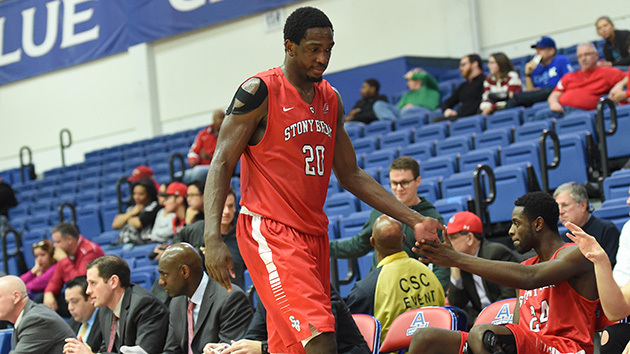 Nor did Stony Brook challenge itself too much in its nonconference slate. It took Vanderbilt to overtime before losing, 79–72, on Nov. 19 and it was drubbed, 86–61, at Notre Dame on Dec. 8. But that has been it, as far as power-conference challenges this season. It’s not like the Seawolves are terriblly familiar with the top-tier talent they’d have to face eventually in the tournament. In pure basketball terms, Stony Brook doesn’t shoot the three-pointer outrageously well (37.2%) and it hits just 67% of its free throw attempts. There’s no secret weapon or equalizer here, and no matter how good Warney is, that’s often necessary for Cinderella to advance.